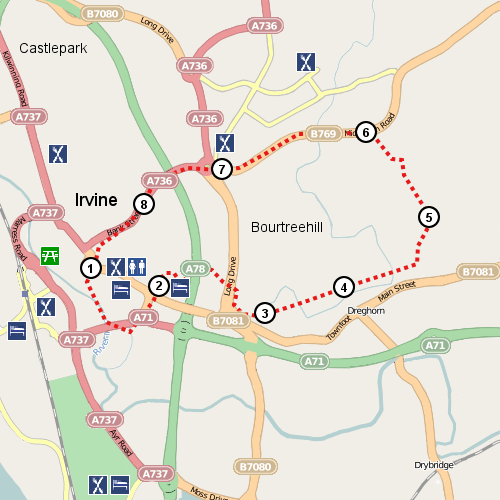 This cycle route starts takes in Irvine’s Harbour front, low green before heading along the river towards the moor and Eglinton Country Park. The paths along this route are suitable for both cyclest and walkers, it’s worth noting however that this route is a substantial length. 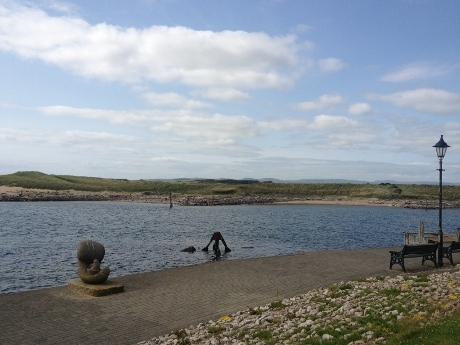 We recommend starting this route at the Magnum Leisure Centre which sites within Irvine’s Beach Park. The Magnum has a significant number of lesiure facilities such as a swimming pool, gym and thearter. From the Magnum head down the path between the Ship Inn and the Harbour Arts Centre (HAC) which will take you on to the harbour front. Irvine harbour was redeveloped during the 90’s, however the harbour retains much of it’s historical charm and offers some fantastic views across the mud flats to the rivers Irvine and Garnock and the old ICI plant (Nobel division) famous for explosives (referred to as ‘The Dynamite’) this area is now an RSPB sanctuary and home to seals. Follow the road towards Irvine Train Station and as the road bends to the left. At the round-a-bout head under the rail bridge, keeping close to the church that sites on the left hand side just under the rail bridge. When you reach the dual carrageway take a sharp left down the path which runs along the side of the road, do not cross the road at the church. The path will lead to a green bridge which crosses the River Irvine, head over the bridge into the Low Green. The Low Green is a popular leisure and recreational area and is commonly used by families to have picnics and to enjoy a sunny day. Once you have crossed the Green Bridge take a left and follow the path along the river bank. The path will pass under a dual carrageway and up a hill, into the Irvine Moor. 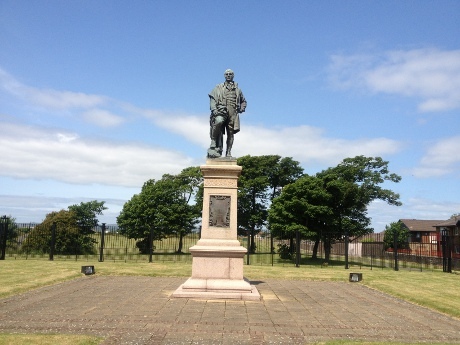 Once you have reached to top of the slope the Burns Statue will come into view. Follow the path across the moor staying as close to the river bank as the path will allow you to. This path will continue along the river bank until you reach the railway line. At this point the path turns to the right and runs along the side of the railway line. Continue to follow the path, crossing the small access road to the Irvine Golf Course. You will reach a recycle centre on your left hand side as the path starts to follow the road. Continue along the path along the edge of the road, after crossing the River Garnock the path will lead across the road and under the by-pass, before following along the banks of the River Garnock. When you reach a junction in the path take a left turn and cross the River. Sticking to the path, pass through the area of housing until you reach the main road. Take a right turn at the main road and following the road towards Eglinton Country Park. Eglinton Country Park is a great place to take a break from your cycle or walk. The visitors centre has a cafe and tolilets and tourist information for much of the local area. During peak seasons you can access an exhibition detailing the history of the Earl of Eglinton and the park itself. The ruins of the old castle site within the grounds of the country park. There are extensive path routes through the park, keeping close to the by-pass will shorten your cycle route, where as following the Garnock River is the longer route. Both these paths lead towards the Stanecastle area of Irvine. When you reach the road at the end of the path take a left turn towards the round-a-bout. At the round-a-about take the 2nd exit onto Lochlibo Road and follow this road towards the Stanecastle round-a-about. This is a major interchange within Irvine so we would recommend dismounting your bike and using the paths avaiable to cross the roads when it’s safe to do so. Take the fourth exit from the Stanecastle round-a-bout into Bank Street. Bank Street will lead you back towards Irvine town centre, when you reach the traffic lights at the end of Bank Street take a right turn onto East Road. When you reach the mini round-a-about that has the Turf Pub sitting on the left and side and a small launderette sitting opposite you. Cross the round-a-bout into Castle Street and follow this road down the hill until you are at the Low Green.